You can Buy Cut Work Jacket Fusion Wear Online from us. We are offering a wide range of Cut Work Jacket Fusion Dresses Online in India. The Cut Work Jacket Fusion Wear that we are offering here is a three piece outfit. It includes a purple colored top made of raw silk, beige colored cigarette pants made of chicken fabric and a cream colored hand-made cut work shrug-in jacket. The top features lining on it and the bottom has a sequence of sequence of Jali work. Buy Cut Work Jacket Fusion Wear Online in all the sizes and at reasonable prices. 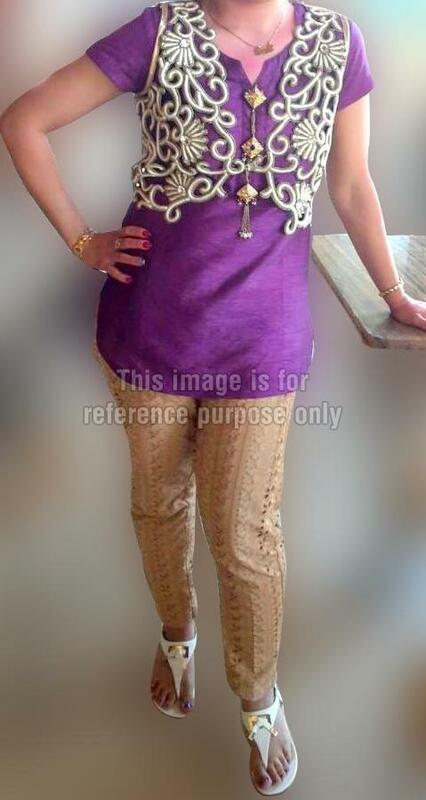 It is a 3 piece outfit- Top-colour-purple-raw silk with lining bottom-beige chicken fabric cigerrete pants jacket- hand made cut work shrug in cream colour .